With tons of room, straps and carry options, this is clearly the best bike equipage I’ve ever owned. Note the reflective strip on the right back pocket – visibility A+. Dank Bags is Seattle based company specializing in messenger bags, tool rolls, coozies and other bike based accessories. 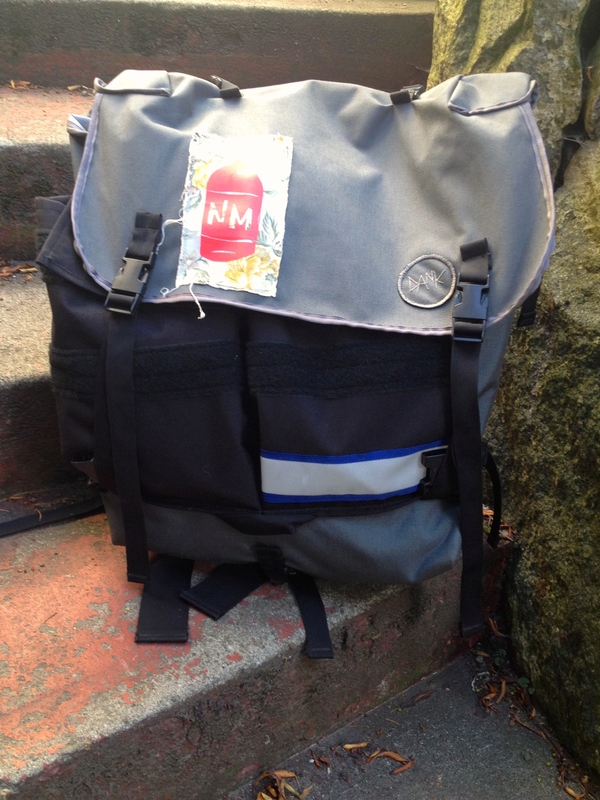 I gotta say – many of the homies who are working messengers have been rockin these bags for years, so when Harpo commissioned one for my birthday I was stoked, having heard so many positive reviews. Now, after a month with it on the bike, I can confirm that the hype is justified – the Dank Bags backpack is the best bike bag I’ve owned. 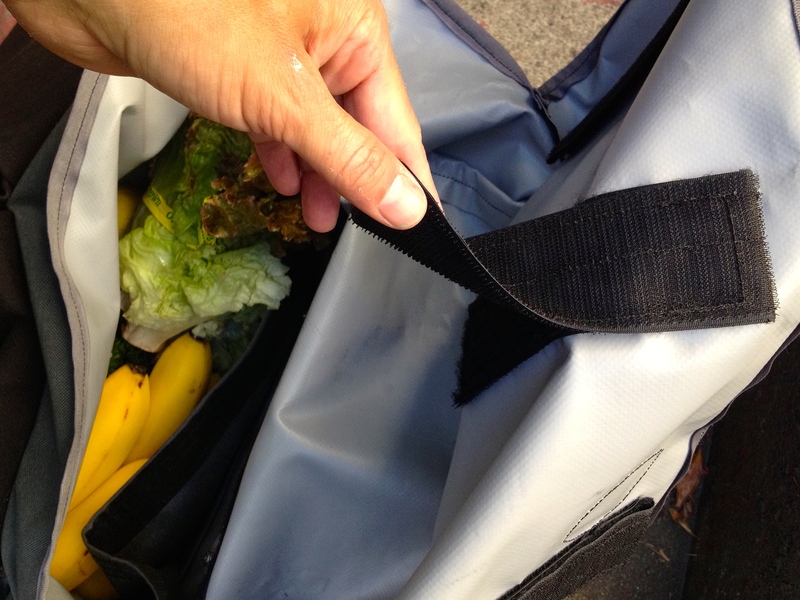 As an urban cyclist, choosing you equipage is an intimate experience… you form relationships with bags you use everyday, through thick and thin and the occasional downpour (ok – through 8 months of rain, lets be honest, it’s Seattle). Over the years I’ve had meaningful relationships with a number of different messenger bags; a Timbukt2 purchased at REI in 1994 (actually probably my shortest relationship – this one didn’t have much to offer), an REI single strap triangle bag (mountain biking 1995-2000), a RELoad single strap bag (2004-09, traded for a painting at the Seattle shop while it was open), a Bailey Works single strap bag (2009-12, a messenger hand-me-down), and most recently, an Ortlieb Velocity backpack (2009-24). I’ve loved all of these bags for different reasons – some for their versatility (the BailyWorks), some for being lightweight (the Ortlieb – also highly visible, in shock yellow) and some for their sheer carrying capacity (the RELoad, with the extension strap, would carry six 30″x40″ silkscreens) but overall the Dank Bags backpack is king. Many people prefer panniers or trailers for carrying cargo, thinking that it’s better to keep the weight on the bike. I prefer to carry my biz on my back – it keeps the handling of the bike nimble and allows me to split lanes and cut narrow gaps with confidence, and climbing the ever present Seattle hills seems easier. I’m also an artist and find myself carrying oddly shaped cargo than might not fit conventional pannier, and I don’t really want to hook up my BOB trailer downtown… it makes riding in traffic difficult, and is a sure target for thieves if you leave it out on the sidewalk. 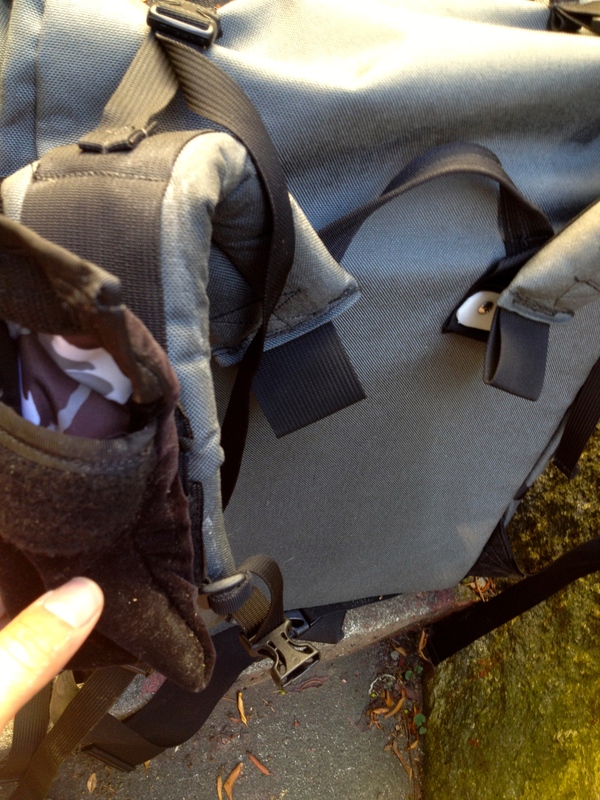 So although I don’t always like carrying 40# on my back, the Dank bag makes the best of a bad situation with superbly cushioned straps, pack lifters (which I never even knew I needed) and a full frame sheet which keeps the cargo from digging into your back while stabilizing the pack shape. With the absolutely brilliant double length velcro straps for the main flap, the built in extender straps, the side compression straps, and the possibility of adding an additional extender strap the carry options are virtually unlimited. This pack will fit 3 30″x40″ silkscreens, gallons of paint, 30 cans of spraypaint, a 18″x24″ sketchbook – all together if you really gotta get it in one trip. The extendo velcro straps are brilliant – the velcro doubles back on itself and can be unfolded to double the strap length, which gives more options to secure the main compartment flap. 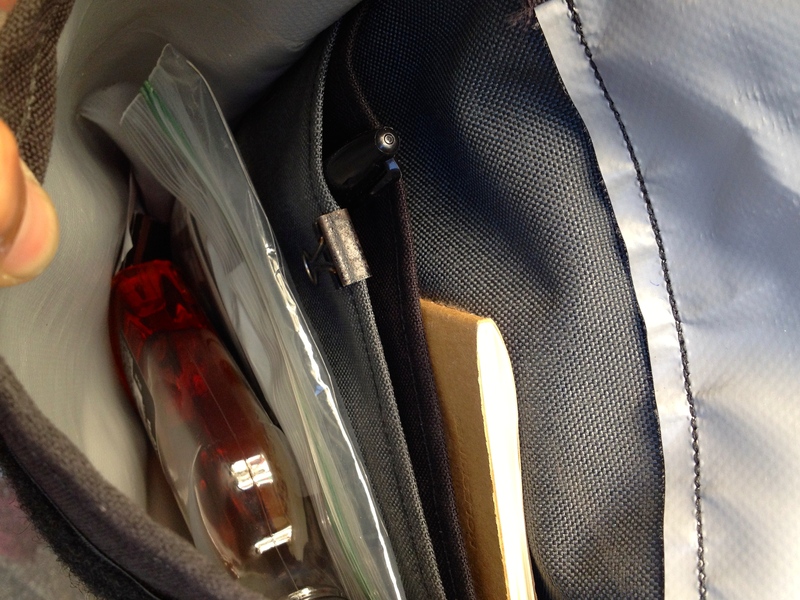 The front closure velcro pockets have ample room for personal effects, and two slash pockets which work great for organizing a notebook, pens, wallet, weed pipe, pint of whisky and other necessities.. The construction of the bag is also bulletproof. Other bags I’ve owned (the BailyWorks, RELoad) have exhibited similar high standards of manufacture, but I think in terms of attention to detail, economy of design and overall thoughtfulness Cory’s bag come out on top. And it always feels good to support a small local producer – these bags are made in downtown Seattle in a shop he shares with Mobius Cycles in an alley off of 1st Ave. 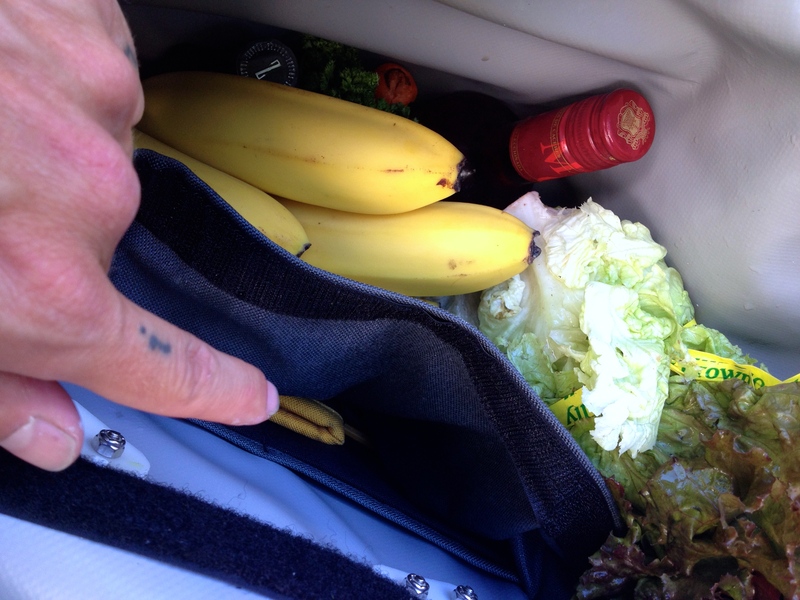 This entry was posted in cycling, gear, songsoutofthecity and tagged dank, luggage, messenger bags, Seattle on July 21, 2014 by GROUCHO.